Gallery of Borders where I visited. During "The Cold War" period, the boundary between British Hong Kong and Peoples Republic of China was a part of "Iron Curtain", and entry of boundary was strictly restricted due to military reason. After Hong Kong's hand-over to PRC, the policy of boundary control has been maintained due to immigration and customs reason under different solical systems. Some restricted area was opened to publicaccess on 15th Feb, 2012, however, the access to Sha Tau Kok town located at the east end of the boundary is still permitted only for local residents. (right) View from KMB bus 78K from Shek Chung Aug to Sha Tau Kok Check point. 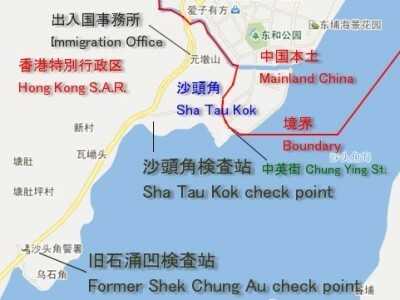 (upper left) Sha Tau Kok Check Point. Access is restricted beyond this point. (upper right) Can not walk through to Immigration office neither. (left) Sha Tau Kok town is surrounded by fences. (right) Notice on the fence. Ha Tam SHui Hang village, newly opened for public access.